The aorta is the largest artery in the body. It arises from the left ventricle (one of the four chambers of the heart) and supplies oxygenated blood to the entire body. 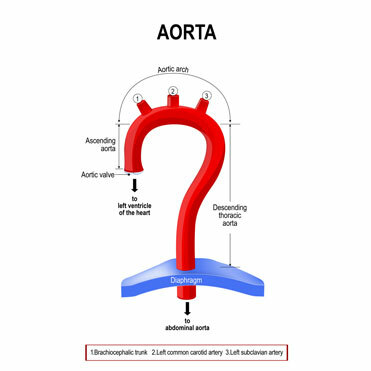 The aorta is divided into the ascending aorta (first part that arises from the heart), aortic arch (middle curved region) and the descending aorta (last section that travels down the chest). The aortic wall on cross section is made up of three layers. Weakness in the aortic wall can cause a tear in the inner layer, allowing blood to leak into the potential space between the layers and separating or dissecting the layers. This is called aortic dissection. The dissection can lead to weakening of the aortic wall and sometimes cause a rupture in the outer wall, which can be fatal. An aortic dissection is a rare condition that is most frequently observed in men aged 60 to 70 years of age. Type A: The tear occurs in the ascending aorta. Type B: The tear occurs in the descending aorta. 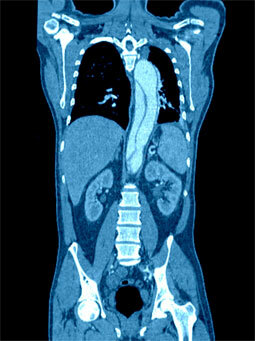 A few sensitive imaging tests may also be performed that include computerised tomography (CT) scan, magnetic resonance angiogram (MRA) and transoesophageal echocardiogram (TEE). An aortic dissection is a life-threatening condition that requires immediate treatment in the form of medical therapy or surgery depending upon the region of the aorta affected. Type A dissection would require emergency surgery, while type B dissection is usually monitored and managed with medication for blood pressure control. Type B Aortic dissection occasionally requires intervention in an acute setting and here the preferred treatment is by endovascular methods. Endovascular repair is a minimally invasive procedure that requires only a small surgical incision in the groin. 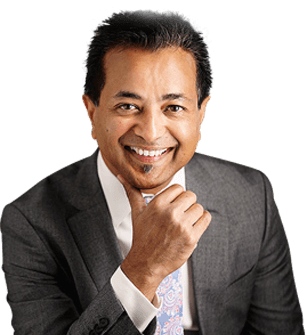 Your surgeon repairs the dissected aortic wall by re-inforcing with a stent graft (a polyester tube within a metal cylinder). Under X-ray guidance, the stent graft is introduced via the femoral artery in the groin and advanced to the origin of the dissection in the descending thoracic aorta. The stent graft is then deployed precisely over the weakened wall and this strengthens this area and allows blood to flow freely through the graft. Thus, the dissection is repaired and it also avoids pressure on the weakened aorta. Following an open surgery, you are required to stay in the hospital for a week or two and 2 to 3 days for an endovascular procedure. Complete recovery takes about 6-8 weeks.